Home/Feature Cars/Factory Specials/1968 Mercury Cyclone GT 500; We have the Proof! 1968 Mercury Cyclone GT 500; We have the Proof! As of 3/2/2015 we have some new additional information on the GT 500 Program that should pretty well fill in most of the blanks. You can visit our two Posts to get this newest information by clicking on the links below. The following information regarding the 1968 Mercury Cyclone GT 500 is published with the most recent information available on top. As you read down, this information gets older AND LESS ACCURATE. The information at the top of the article is the most accurate we have at the time of the update. Where there are conflicts of information please rely on that closest to the top. Very soon we will be taking this page down and eliminating the oldest information. We will only publish what is yet in question and what we known to be reasonably accurate. We will be eliminating the rumors we have found to most likely be untrue. IF YOU HAVE ANY INFORMATION, PHOTOS OR OTHER RELEVANT DATA ON THESE CARS PLEASE SEND IT TO Richard@LegendaryCollectorCars.com SO WE CAN SHARE IT WITH ALL OF OUR OTHER READERS. However, the questions continue to come in and add additional questions to what we thought we knew. Click Here to visit our newest unknown, a Green “possible” GT 500. Look it over and tells what you think. Can you help prove this is real or something else? To see the Cyclone GT 500 Registry, Click Here. Here are some of the best photos we have obtained regarding the GT 500. We don’t talk much about the 1968 Cyclone GT 500 because we know so little and there just aren’t any around. However, we recently received an email from K. Peppers with some information and photos that we thought deserved a little special attention. If you want to know more about these cars we have listed as much as we know on this site and even register them here. Peppers states that he is restoring the GT 500 for his cousin whose father bought it new. He hasn’t started on the restoration yet and based on these photos I think he should keep it original un-restored. What do you think? He is going to get a Marti Report before doing anything. We hope to have more info on this car soon. Tommy Hussey has white GT 500, or does he? We need more evidence to figure this one out. The car was built on March 3, 1968. This is the same month as the Atlanta Race on March 31, 1969 when the first dealer promotion was held. (Read the articles much further down on this page regarding that race and the Ford World report.) Most of those cars were white. Tommy’s car is a 302; rumor has it that the white cars were 302s and the orange cars were the 390 and 428 CJs. You should also compare the photo here with the ones of the Hans Melin white car below. His also has the emblems but he sold the car many years ago and no longer has the VIN info. In the August 1968 Motor Trend you can read the mention of the Cyclones for the Atlanta Race. They even mention Cale as having won. Also note that they wished to duplicate this slick promotion for the Charlotte World 600. The next image is the bottom piece of Steve’s Cyclone build sheet. Notice it starts off with Charlotte 600. Steve states that the Cyclone never had a hood stripe, but notice the word hood is spelled hpod. He believes the line guys got confused and left it off. Steve has talked to the original owner, and he said it was never on the car. Here is some more information that was sent to us by a reader. I received a wonderful Christmas Present from one of our regular visitors and contributors to this site. John Drilling provided us with a newspaper advertisement for the GT 500 dated Friday, April 5, 1968. The newspaper is the Herald Journal of Spartenburg, SC. The good news is that it describes the Montego Cyclone 500 in some detail. It includes a 390 GT engine, performance handling package, blacked out grill, dual body tape stripes, GT Turbine Wheels Covers, CYCLONE 500 IDENTIFICATION, 390 GT Engine Plaque and BUCKET SEAT interior in black or parchment trim with CORAL EXTERIOR PAINT, CHECKERED FLAG VICTORY PLAQUE. What is never mentioned in the ad is the transmission. Now for the bad news; it still leaves a slight bit of confusion. As we currently understand it all of the GT 500 cars were built around the first of May 1968 and most if not all were in the Coral paint scheme. So, if this is correct was the Bayless Mercury dealer advertising a car that was yet to be built and delivered or was it one of the Cyclone 500 cars from the Atlanta Race? Unfortunately, this advertisement does not specifically mention GT 500. This may have been due to the previous run of Atlanta cars being labeled as Cyclone 500s. Most if not all of these were white with a rumored Coral car or two. There is also no mention of the 428 CJ option in the ad above. However, since it is dated prior to the build date of most is not all GT 500s I bet the information provided by the factory to the dealers was not very specific or accurate on the yet to be manufactured sixty GT 500 cars. We have seen this with pre-production Ford Talladegas and other cars where the lead information is not the same as what actually was built in some details. I have currently of the opinion that this ad is for the yet to be built GT 500 since it mentions the two interior colors and Coral exterior color. Here is proof of the VIN over stamping on the 1968 “R” Code Cyclone GT 500. What you see below are photos of my own personal GT 500; VIN, Data Plate and Inner Fender Stampings. I have purposely not included the entire VIN for obvious reasons. However, this VIN has been provided to the Marti Report folks and verified as a GT 500 428 CJ “R” code. In summary, on the VIN the “R” is actually an “F” with some form of over stamp to make it an “R”. The Data Plate is a ordinary “R” stamp. On the inner fenders the location where the “R” should be in the sequence is left blank. On one fender some previous owner scratched an “R” into the blank spot. If you are interested in what is being discovered about the Cyclone GT 500 you will want to be involved with the Cougar GT 500 or one of the other Factory Specials we are going after. This is your chance to get involved and really help the hobby out. Click Here to visit our new pages “FACTORY SPECIALS”. 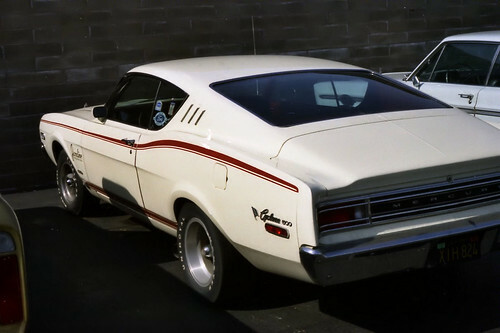 I have just receied some additional photos from Hans regarding his 1968 Mercury Cyclone GT 500 in White! You can read more about the car below and I have added all the photos Hans has sent. From the lettering on the front fender in one photo you can see that this 390 did some track time. It was part of the Wilson Ford Drag Club! We are getting closer on info concerning the Orange GT 500s but now these white cars need to be documented; please help us out if you have any additional information. Hans is also going through some Chemo treatments so say a prayer for him. Here is another recent photo of a 68 Cyclone GT 500 just discovered in a back yard. It is a 428 CJ! The black stripes on the hood ARE NOT ORIGIMNAL. 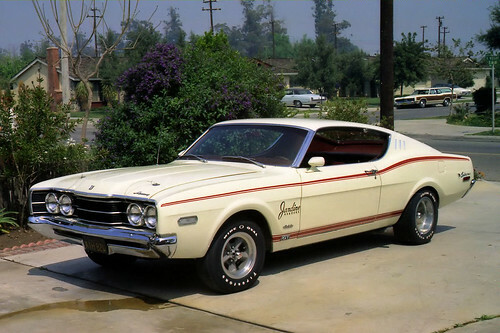 Marvin Speaks suggests that the reason some of the GT 500s have white stripes and others have black is that the 390 cars all had white stripes and the 428 CJ cars had black. Makes sense to me but can anyone confirm this with a Marti Report or other documentation? He said he bought a 390 GT 500 in May of 1968 and it had the white stripes. Well, now there is even more info and more confusion. Thanks to Hans Melin of CA we have some more info to put into the basket. He once owned a 1968 Wimbledon white Cyclone GT 500. 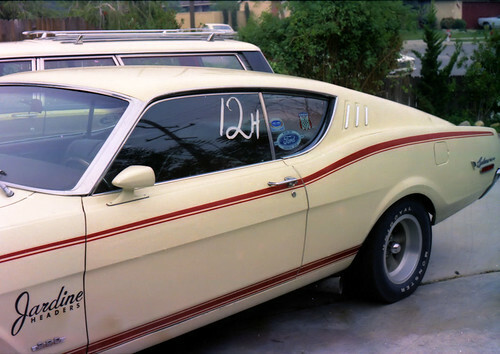 He was the second owner and purchased it in the early 70s in original condition. It had a 390 and all the appropriate flag and 500 badges. Since he no longer owns the car or has the VIN and Marti Reports were not available we can not document it but we do have vintage photos which indeed show what looks like the proper emblems. This car was sold new in Santa Ana, CA a long distance from the Atlanta Region that was believed responsible for these cars. However, it is possible that it was delivered to CA. However, this does tend to support the idea of multiple special promotional cars out of 1968. If you have another let us know, we are trying to put a puzzle together. As usual, I am wrong again; there are more questions about the entire Cyclone GT 500 issue. Thanks to John Drilling from Greendale Wisconsin some additional information is know but more questions are now unanswered. John provided these two images. As you can clearly see, this NASCAR program is from the 1968 Carolina 500 held on June 16, 1968. Inside this program is the attached ad for the Cyclone GT 500. You can clearly read the text on this ad. Prior to this we believed that the GT 500 was built for the Darlington Race in September. This ad suggests that they were built for the Carolina 500 held in Rockingham North Carolina. This makes me believe that the cars were a promotion for the Carolina 500 and not the Southern 500 in Darlington. This would actually make more sense. The cars were all built in mid May and, as far as I have seen, all sold in or around the North and South Carolina area. This makes me believe that the cars were a promotion for the Carolina 500 and not the Southern 500 in Darlington. As further evidence, John also provided the following two additional items. The first is a letter from Ford to “All Mercury Dealers” and describes a Promotion held in conjunction with the Atlanta 500 held on March 31, 1968. (Remember the Cyclone GT 500s were not built until May of that year). It was part of a “Drive-Away Program where the new owners took delivery of their new Mercury Cyclones at the Atlanta 500 and got a lap around the track (see second image below). You will note that most of these cars appear to be white with a few painted vermilion. You will also note that there were 160 cars built but they are not called GT 500s! They are called Montego or Cyclone 500s. This helps clear up some of the confusion from folks who claim to have white GT 500s and those with the 302 engine. Does anyone have information on the Carolina 500 and a possible “Drive-Away” promotion at that race? How about anyone who has information on the Atlanta 500 program and those 160 cars? We may be on the track of a entirely lost or at least forgotten group of special interest cars! You guys (and gals) are the best. You have given me more and better information than I have been able to get on any forum! Fellow car enthusiasts keep emailing and calling. With every phone call and every new email we learn a little bit more about these rare cars from 1968. Muscle Cars are a lot of fun to play with but the detective work it takes to learn about them is also a great deal of fun. Keep looking and letting me know what you find out. As of this date I think we may have all the missing pieces. With the help of research conducted by Marti Auto Works here is the rest of the story…. The cars were built for the 1968 Darlington Southern 500 held on Labor Day. 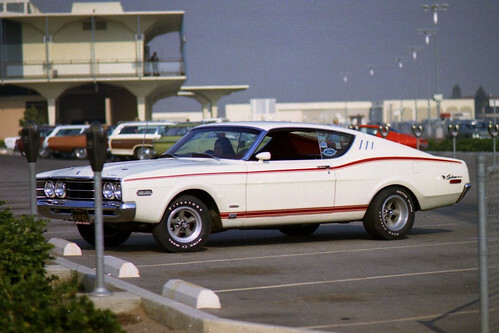 As stated before there were only 60 Mercury Cyclone GT 500 cars ever built; all in 1968. They were ALL painted Vermilion. There were reports of white cars but not according to Marti. 45 cars out of the 60 built were produced with the 428 CJ engine. All 45 428 CJ cars were Ram Air equipped. All 45 428 CJ cars had automatic transmissions (C6). These cars did NOT have their own Body Code designation. Although ours only shows a “63” others all seem to have the regular “63H” code. No proof but all cars seem to have black bucket seats with console. No info on tire and wheel combination. It is assumed that any option was available that could be had on a regular GT. There was a swept back checkered flag emblem on a small pole located on the rear quarter panels. The build date on the my car is May 4, 1968. The car was sold on June 10th; most of the cars seem to be built in this window. Most likely all at the same time. It has been stated that the checkered flag cam from a 64 Comet – part number C3MB16188A C3MB16189A. The part number for the 500 emblem is C8AB – 82290098 – A and it looks like a 68 Galaxy. The following information has not been edited since it was posted. It provides a historical and chronological record of the information (true or false) as we received it. As of 2/3/09 we now know a little more. I am still waiting on some research that the Marti Report folks are doing for me but I will give you the info I have collected from the most recent 3 car guys who have called or emailed me. One even came from out of state to talk and look at cars.Guys who have owned GT 500s as well as recorded VINs and data plates have helped put some more pieces of the puzzle together. My previous information about all the cars being 428 CJs and all identical is most certainly not true. It appears that at least a couple of the cars were white and not Vermilion (orange). The Vermilion cars that have been reported all had bucket seats in black but side stripes could be white or black. The upper stripe is not a GT stripe but rather the thinner version. It seems that advertisements for the cars showed wheel covers but many were optioned with the steel wheels, trim rings and center caps.Based on what I have been told as well as the advertisement for the car it is unlikely that any 302 cars were built. However, I have received insistent reports that more than one 302 car has been seen and validated. The official position is that the base engine was a 390 but the Q Code and R Code 428 could also had in the GT 500.
Who won the 1969 Southern 500? Cale Yarborough in his Mercury Cyclone! The following information was as of 1/2/09. Finally, after six months I have some really good info on the GT 500. Thanks to Alan Miller, who owns one of these very rare cars (pictured below) I now have a much better idea of what we have. However, there are still some unanswered questions. I will bring you up to date along with what info I am still looking for. 1. 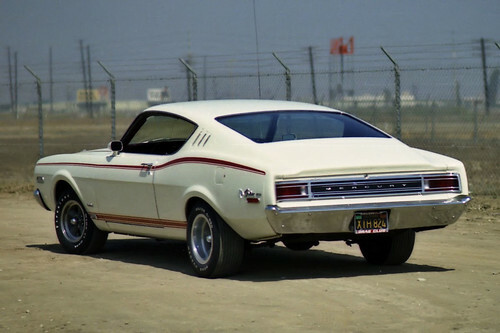 The 1968 Mercury Cyclone GT 500 was built for the 1968 Southern 500 in Darlington. As stated previously, only 60 of these cars were built and they have their own body code on the Data Plate. It was previously believed that all of them were 428 CJ cars but this was not the case. 2. The base engine was a 390 with the 428 CJ as an option. 4. All interiors were believed to be black with bucket seats and console but could be either 4 speed or automatic. The steering wheel should have a leather wrap and the dash should have the wood grain treatment. 5. An advertisement from the Southern 5oo program provides additional insight into the standard equipment and it can only be assumed that all regular options could be added to the car from there. 6. One very interesting bit of information I am lacking is details about the 1968 use of the 428 CJ in the Cyclones. The reference books I use only list Q, 8, or P as possible engine codes in the VIN. The 428 CJ only became available in Cyclones, Mustangs and Torinos very late in the model run and are referred to in most books as 68 1/2 models. In 1969 the R code in the VIN referred to the 428 CJ Ram Air motor in the Cyclone. The Marti Report for our GT 500 states that our VIN with an R for the engine code in the VIN is a 428 but makes no reference to the Ram Air. Since our car was missing its engine and hood there is no way to know if it should be a Ram Air car or not. DOES ANYONE KNOW IF THERE WERE ANY 1968 RAM AIR CARS BUILT? I have what is called a 1968 Mercury Cyclone GT 500 with a Marti Report to document what it is. The car is so far gone it is difficult to know what it is suppose to look like. The Marti Report says only 60 GT 500s were built. I have no idea what this gt 500 option included or how the car should look. Is it worth a restoration? Is the GT 500 something cool or just another stripe package? I do know the car is an original 428 CJ so it does have some value. I have been told it was a special edition built for a NASCAR race in Charlotte and that likely all 60 were identical. It is suppose to be a GT with a GT 500 option, vermilion color, black bucket seats with console, PS, PB and AM radio. I also understand it should have some emblems on it but not sure what they should be. I have heard of two others in existence but can’t find owners or pictures of any. I NEED PHOTOS OF A CORRECT GT 500 IN ORDER TO RESTORE IT CORRECTLY, HELP! 1. Most believe that all 60 cars were identical but it has not been confirmed one way or the other. 2. If they were all alike and based on my Marti report; they would be orange with black bucket seats and console, PS, PB, 428 with C6, AM radio and regular GT package. 3. I have been told there was a swept back checkered flag emblem or decal on a small pole located on the rear quarter panels. It was likely pot metal type emblem chrome with black checkers. It’s very close to what was on the early sixties Marauders, knowing Ford they could be one in the same. One person states: I think the checkered flag was on the rear quarter panels with a “500? emblem, can’t remember if it was just the numbers or a block type emblem with numbers inside…for some reason the numbers only seems right, in the vicinity of the side marker light. I didn’t have my camera with me, there was actually two of them in a guys backyard in the Charlotte NC area. He was a member on a NASCAR pitcrew, Bud Moore racing team…way back in 1980. 5. Several people remember seeing a group of these cars at a race track, likely Charlotte, for a NASCAR race. That would make sense since it was 1968 etc. Anyone have any old NASCAR programs, newspapers or other items that might show the cars? 7. The build date on the my car is May 4, 1968; again this would work for the Memorial Day Charlotte World 600 race. The car was sold on June 10th so it could have been at the track with other similar cars. I am trying to contact the track and see if they might have any old records from back then. 9. Richard the 68 cyclone GT i saw was orange with white strips and the “flag” was before the cyclone script on the rear fender and the “500” was after the cyclone script , the tail of the flag emblem seemed to be lower and in front of the reflector under the cyclone script , this is my best guess from 25 years ago, i think there was one of these cars on ebay 4 or 5 years ago ? 10. Can anyone remember any more detail that would help? You can send an email or leave comments at the bottom of the page. My response is factual. Richard & I discussed this in private emails. Apparently Richard had switched servers and that created some posting issues. No harm no foul. You are correct about the 427, Cougar GTE’s only in 68. I have the production numbers somewhere but I don’t want to get off topic. If interested in those numbers, feel free to pm me. 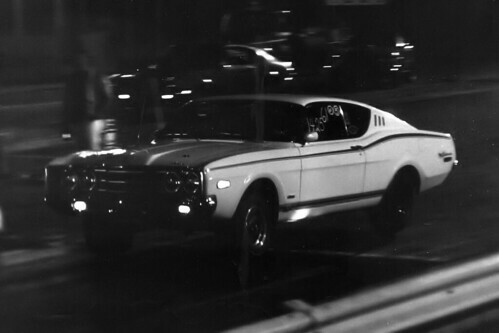 Rod CJ, The only “428 CJ’S” built prior to regular production units were the 50, white Mustang FB’s, that were built Dec/67 – Jan/68 and dominated the winter nationals. One additional side note: all but one of the 68 Torino CJ’s built for the 68 model were automatic’s. The “one” 4spd, was built for then Ford president (19 months) Bunkie Knudsen. How can a send you pictures of a ’68 cyclone cj428? My dad took me to the saturday pole days and qualifier races at charlotte in the 1960s. i have a picture somewhere of a large group of orange mercury cars. I have a new car flyer with Burrough Lincoln Mercury pete pistone salesman that i picked up that day. Probably the May world 600 race. i was told that day there were 500 mercurys there.I remember some had black or white stripes.Some had black or white interiors.All were not fastback bodies.Some were 2 door coupes and some convertibles.They sat in turn one area outside the track.We spent a good while there as salesmen approached my dad to buy a car.They cant all be 428 cars i am sure and i didnt count them.I do know where on orange notchback car sits and it is 302 black bench seat and the owner says he made the deal thru the salesmen at the track and picked up the car that Monday!I will try to make a trip up his way again soon to see if they have any old documents about the car.There is also a 1 owner 428 black bucket seat automatic car a few blocks from me and no money can buy it. i can check it and get some pics for you.Interseting story that brings back some good memories. See what you can dig up and let me know. This info would be extremely helpful as would the photos. You can send them directly to me at Richard@LegendaryCollectorCars.com and I will share them with the rest of our readers. THANK YOU! I previously owned a Mercury Cyclone GT with the emblems. I bought the car back in the late 70’s in Haleyville AL from a private party. The engine was a 390 and the car was white with red stripes as I have seen in some of the photos above. If I remember right I think this car had a red colored interior. The engine compartment was so tight we had to loosen the motor mounts to put headers on this engine. I also remember it had disc brakes on the front. Sorry I cannot be of more help. Think, Car Sales, Look Only For DSO Atlanta Cars, All Or Most Sold There, As There Where Ford Teams Present, Most DSO Atlanta Cars they Sold There Or At Local Dealer, Knocking The Doors Down, And At All Events, Move Up, Pops. 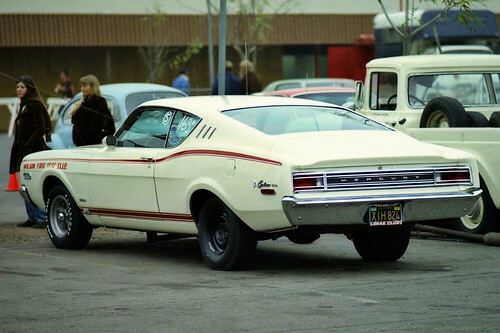 I owned a 1968 mercury cyclone, back in the 70s. It was orange with black stripes and a 428 SCJ engine. With a 4 speed Hurst trans. It had a battery mounted in the trunk?? Have you ever heard of that ?? I could literally do a wheelie with that car ! I think I had something special and sadly…just didn’t know it. Kevin, your ’68 Cyclone is still in Chatham and has been fully restored. I found it behind a barn in Raleigh township in the late 80’s or early 90’s.Maroon, white interior 428 CJ. We have a 428cj engine that has a vin stamp for a 67 or 68 mercury. Waiting on Marti report to see what exact car it came out of. Just maybe someone on here has the car this engine was built for.